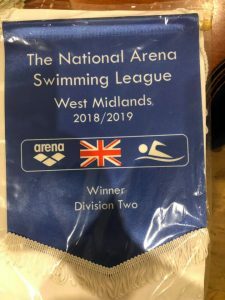 The National Arena League is currently the largest swimming team competition in England, with approximately 400 teams participating across the country. The country is divided into regions with each region then being divided into divisions. Wyre Forest fall within the West Midlands region, within which there are three divisions – Premier (24 clubs), Two (24 clubs) and Three (23 clubs). Wyre Forest is currently in Division Two. Swimmers are broken into male/female swimmers which contain age groups – 9-11, 13 & under, 15 & under and Open. Within each age group there are individual races of 50m and 100m in each stroke. There are also two relays per age group, freestyle and medley with a final very exciting 6 swimmer cannon relay. 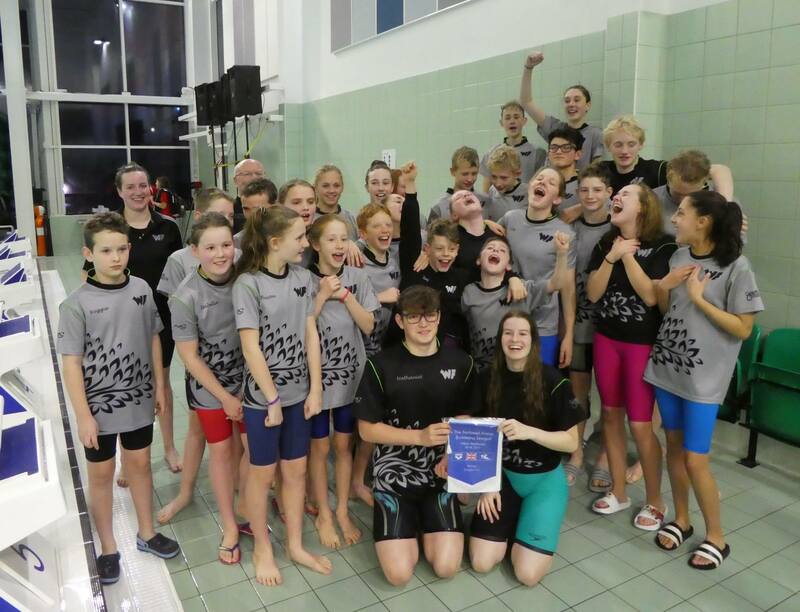 Having placed first in their first round and second in their second round, WF swimmers headed to Perdiswell Leisure Centre with high hopes of challenging for another first place finish and a chance of promotion to the Premier League in 2019. After the first very tense 10 events, WF found themselves in an early lead but there was only 1 point dividing the teams placed in 1st, 2nd and 3rd places!! An update from the announcer revealed that we were still in the lead after 26 events, still with only a narrow breathing space of 3 points. Foresters dug deep, urging each other on and after 34 events we had put our foot down and gained ourselves an 8 point lead over our nearest rivals, Leighton Buzzard. At 42 events, WF were beginning to believe in themselves and each other, powering their way to a 13 point lead with only 8 events remaining. With the travelling Forest parents and family roaring them on, WF swimmers refused to ease off the pressure and stormed the final events to an absolutely amazing 20 point victory! The final scores, which saw Wyre Forest crowned as Division Two Champions were:- Wyre Forest 208, Leighton Buzzard 188, Ripley Rascals 180, Witney and District 176, Northgate 158 and Halesowen 136. Swimmers to represent WF in the competition were:- Brad Baddams, Ryan Bloomer, Charlie Brown, Thomas Brown, Isabelle Bowers, Matilda Calder, Lily Colley, Nathaniel Crowther, Theo Crowther, Rob Darbyshire, Tyler Elwell, Millie Gardner, Lillie Grover, Will Guest, Colby Hands, Joel Hands, Tegan Hands, Alexandra Hayes, Reegan Hill, Isabella Hoare, Mollie Kilgour, Chloe Lawson, Adam Newey, Lucy Nicholls, Sam Osborne, Shay Parker, Abbie Rowley, Lois Stevens, James Vaux, Emily Watkiss, Jasmin Yates, Brecon Westwood.